Despite Bayern’s win against Wolfsburg on Saturday the Champions League fixture AEK Athens v Bayern remained in the shadow of a questionable press conference issued by President Uli Hoeneß and CEO Karl-Heinz Rummenigge. It was a somewhat pedestrian performance against Wolfsburg that was followed up by another win against AEK in which Bayern were dominant but also somewhat lacked urgency. It took Bayern some time to settle into this game. Robert Lewandowski produced the first chance after ten minutes but saw a header, following a Thiago corner, saved by Vasilios Barkas. Then in the 17′ minute, Rafinha burst into the box, but his low targeted ball inside the box was cleared at the last minute. Die Roten were dominant regarding possession. But a spark was missing with the final ball or run into the box often sluggish and to easy to break down by AEK. In the 26′ minute, for example, Thiago found himself with room on right side of the box, but his pass was too imprecise missing both James and Lewandowski. AEK Athens found it easy to break down Bayern’s attacks in the first half. The Bavarians were, slow, sluggish and bereaved of ideas to break down the Greek champions, who were in turn happy to carry a 0-0 draw into the second half. Nothing seemed to work for Bayern in the early stages of the second half either. 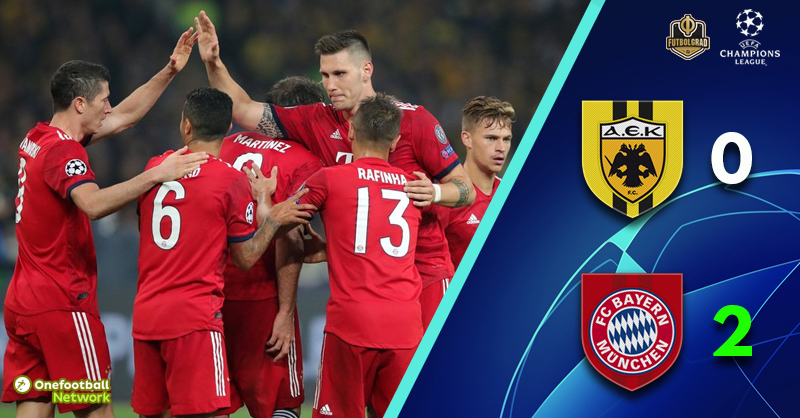 AEK Athens found the room to counter and with more consequence should have scored early when Anastasios Bakasetas easily breezed past Javi Martínez and then ran towards Manuel Neuer’s goal but the Greek forward lacked the gut to go all the way, and his shot from 20-yards sailed over the net. Meanwhile, Arjen Robben found the room for his trademark move in the 54′ minute but whereas in the past his shot would have hit the top corner his shot fizzled out and barely reached the goal line where keeper Barkas had an easy time collecting the ball. The monotony of Bayern’s attacks was finally broken in the 63′ minute. A low pass from Mats Hummels found Robben, the Dutchman had his shot blocked, but Javi Martínez volleyed the rebound home. Just one minute later Bayern doubled the lead. Serge Gnabry played a low ball into the box that eventually found Lewandowski and the Polish striker simply had to tap the ball across the line. See Bayern live! Book your European football travel now by visiting Nickes! In the 66′ minute the referee team had to consult goal-line technology to determine whether Bayern had scored a third. This time Joshua Kimmich played a low ball into the box that was redirected by Lewandowski, but goal-eye determined that keeper Barkas had stopped the ball before it crossed the goal-line. The Germans now dominated sat back to see the game out but could have added one further goal in the 91′ minute when Leon Goretzka found himself with plenty of space inside the box; his volley was blocked, however. Not that it mattered, in the end, Bayern were clinical to see out a match in which they had some difficulties for the first 60 minutes. Rafinha was the man of the match. The Brazilian left-back played two key passes that led to goals in the second half. He also managed to bring 86.9% of his 79 passes to his teammates and also won eight out of his 12 duels. His forward runs and dangerous low crosses finally broke the deadlock in Bayern’s favour in the second half. Some will call this clinical performance others will criticise it as to slow and pedestrian. The truth for Bayern lies somewhere in-between. Der Rekordmeister dominated the match, but it took 60 minutes for the Germans to finally create some urgency and break down AEK. Following the two goals, Bayern went into cruise control and easily saw the match out. Manuel Neuer made his 76th appearance in European competitions for Bayern today pulling even with legend Sepp Maier. Bayern are now unbeaten against Greek opposition in ten games.